Home BTC BTC or XBT? Why Are There Two Ticker Symbols for Bitcoin? Most crypto users know Bitcoin under the ticker BTC. But this is not an “official” abbreviation. Such a term has no place in a decentralized network anyway. In fact, XBT is actually used as an alternative. But why? National currency ticker symbols have been defined by the International Organization for Standardization (ISO) in ISO 4217 as follows: The first two letters designate the country, the third the name of the currency. The British pound, for example, Japan’s currency code is JPY — JP for Japan and Y for yen. By contrast, value preservation and transaction funds other than local currencies begin with an X. For example, gold, silver, and platinum have the tick symbols XAU, XAG, and XPT. The respective abbreviation of the precious metal in the periodic table is then appended to the X. One unit describes one troy ounce each (about 31 grams) of the corresponding element. Those who call Bitcoin XBT bring the cryptocurrency close to precious metals and reaffirm the claim that it is “digital gold”. Other cryptocurrencies are also based on ISO 4217, eg Ripple (XRP), Stellar (XLM) or Monero (XMR). For Bitcoin, using XBT avoids overlapping with the currency of Bhutan. The Himalayan kingdom cuts its national currency Ngultrum with BTN. So that would be the B and the T of BTC so actually reserved. 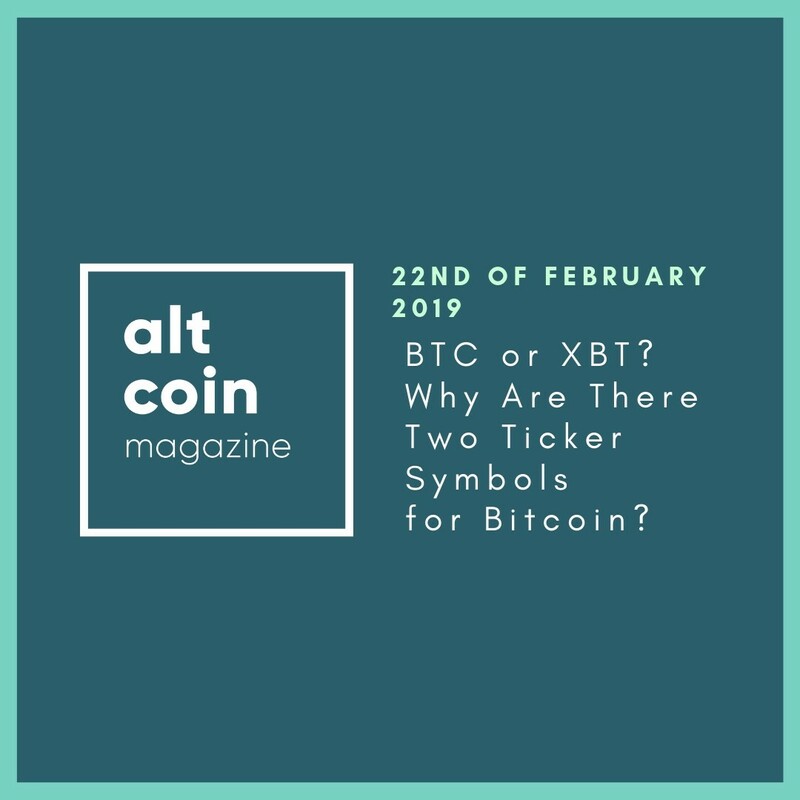 Despite these reasons for the use of XBT, the abbreviation has rarely been able to prevail against BTC. However, XBT is used by BitMEX, the world’s largest exchange for crypto derivatives. The crypto exchange Kraken could not seem to decide: On Kraken.com/Prices XBT is used on another hand on Trade.Kraken.com is used BTC. As early as 2013, Coindesk author Jon Matonis advocated for ISO to recognize XBT as the official ticker symbol for Bitcoin. The organization has not yet done so. So it’s up to us to decide which abbreviation we want to use — or whether we like to think of a new one. Which ticker symbol for Bitcoin do you personally prefer? Write us your opinion in the comments below!